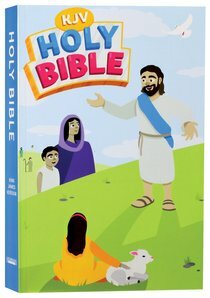 About "KJV Kids Outreach Bible"
The KJV Kids' Outreach Bible introduces young readers to the time- honored KJV text in readable black letter type. The full biblical text is accompanied by a number of helpful resources that will allow those who are unfamiliar with the Bible, as well as new believers, to understand the Gospel. The article "How to Become a Christian," written by the Billy Graham Evangelistic Association, lays out in simple language the basic ideas of Christ's sacrifice on the cross and what that means for each of us. Easy-to-understand sections with paralleled Bible verses-such as "We are sinful," "Sin has a penalty," and "Christ has paid our penalty! "-guide the reader down the path to a personal relationship with God and encourage them to invest in a Christian community. - "Harmony of the Gospels"
The KJV Kids' Outreach Bible includes everything that is needed to illuminate God's love for every single one of his children. <br>• "Harmony of the Gospels"